Meatloaf is always one of those quick and easy meals, and stuffing it with cheese is the only way I like to eat it! Even with those numerous versions, I have never had it anywhere outside my family with mozzarella cheese inside, and I won’t eat it any other way. For me, the cheese is what makes it so good. So maybe no one else does this and I am giving away a ‘secret family recipe’. If so, sorry family!! Then again, it isn’t the first family recipe I’ve posted (Chicken a la Gurnham & Christmas Sandwiches). This recipe makes a huge loaf, and it reheats really well for leftovers the next day. We often make this during the week so we have leftovers for lunch for a day or two, especially when we were both working outside the house. 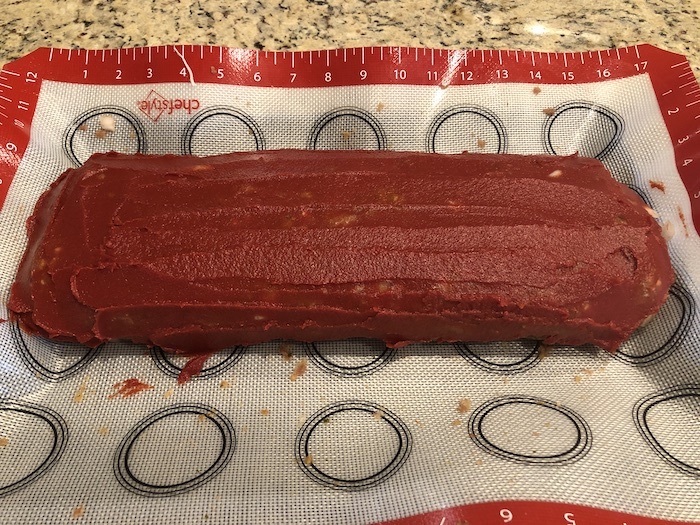 The trick to this is to use either a silicone mat or aluminum foil to roll the meatloaf. Once you have all the cheese inside, it’s not easy to use your hands to fold it over properly. I’ve always used aluminum foil, but in my efforts to cut waste we will be using our silicone mat next time. Preheat the oven to 350F. 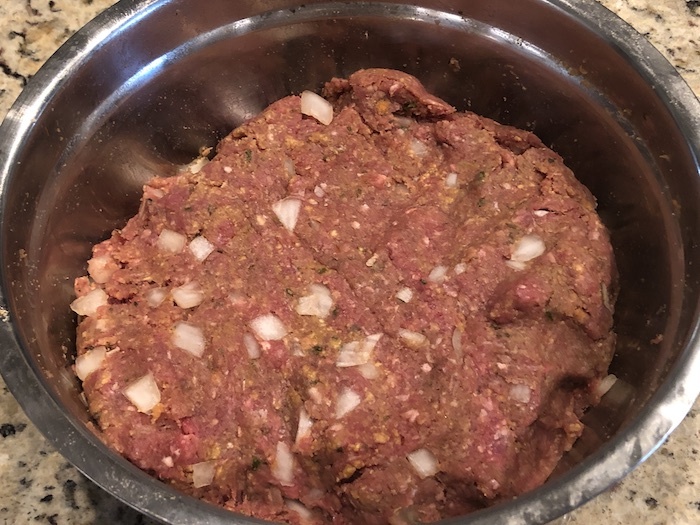 In a large mixing bowl, mix the ground beef, bread crumbs, eggs, parsley, onion, pepper, spaghetti sauce, onion powder, and garlic powder. You can try to use a spoon but I find it’s best to get down and dirty and use your hands to mix everything thoroughly. 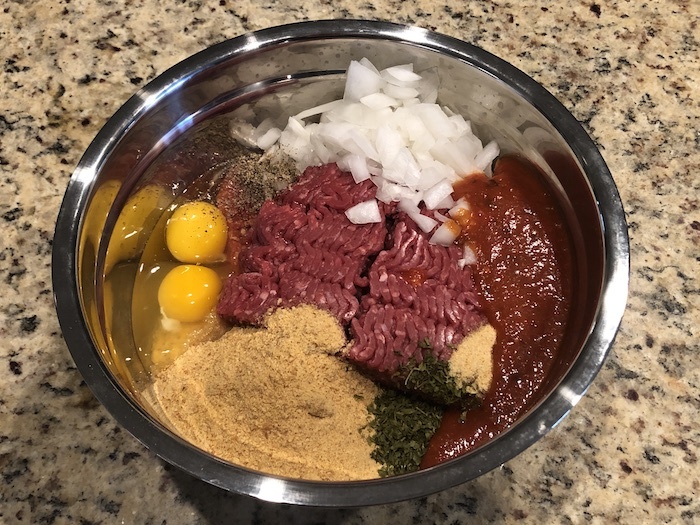 Spread the meat mixture out onto a large silicone mat or piece of aluminum foil. Again, a rolling pin usually sticks to the meat, so your hands work the best. 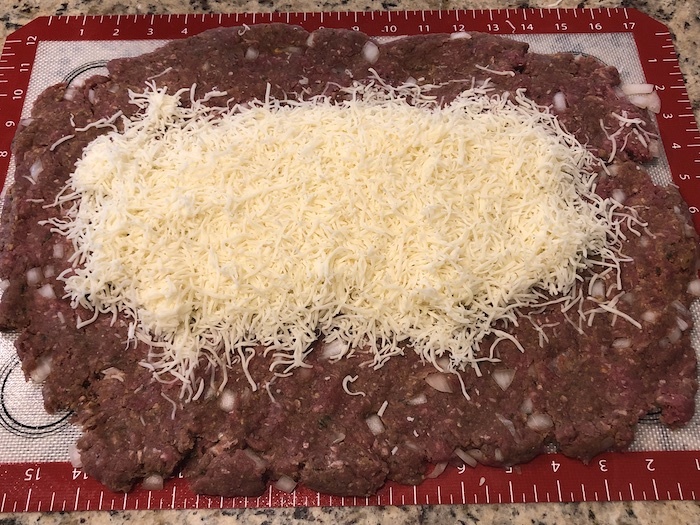 Place the cheese down the center of the meat, leaving about 1/4″-1/2″ around the edges. 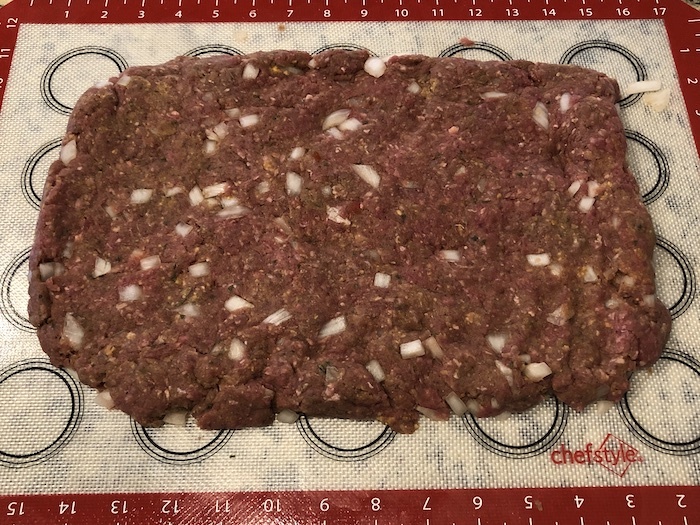 Use the mat or foil to roll both sides of the meat together. I find it works best to bring one side up to just past center, then bring the other close to it. Peel the foil away from the bottom side, and lay the top over the exposed meat. Then press to seal the meat together. Roll up the ends of the meat and press to seal so the cheese doesn’t leak out from the sides, either. Cover the entire thing with tomato paste. Make sure to get the top and all of the sides. Carefully move the entire thing to a baking dish or a cookie sheet with sides (to catch any juices). Bake for about 40-45 minutes, until the meat is done. Use a meat thermometer to check the doneness as the spaghetti sauce and tomato paste will make the meat look red when you cut into it. Just make sure the thermometer is reading the meat and not all the way through to the cheese. Meatloaf doesn’t do it for me, however I’ll pass this recipe along to my mom. Thanks. I don’t like regular meatloaf either. This is the only way I will eat it. When it’s loaded with cheese it makes all the difference! 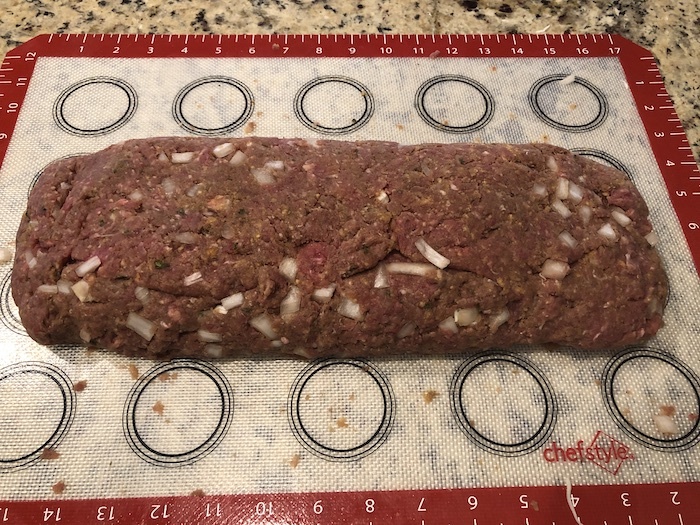 I would have never thought of stuffing meatloaf with cheese! This looks so good. My family will love this! It’s the only way I will eat meatloaf! I love meatloaf this Mozzarella-Stuffed Meatloaf looks yummy and easy to made I will save this post! Thanks for sharing. I hope you get a chance to make it and enjoy! The leftovers reheat well, too. This sounds like a great recipe and pretty straightforward to make too – my daughter would love this! It’s so easy! The hardest part is making sure the edges seal so it doesn’t leak cheese when it cooks. Holy cow! My girls would absolutely LOVE this – they love ANYTHING that is covered or stuffed with cheese! I am with your girls! Anything with cheese is the best!! This looks really good. You took a combination of items and created a lovely meatloaf. When I first made this, it seemed like such an odd combination of food, but it works so well! I like meatloaf but I don’t cook it very often. This recipe with mozzrella looks delicious and is a great option to have something different. The mozzarella inside is the only way I will eat meatloaf! It’s definitely different from traditional meatloaf. Mozzarella is one of my favorites, too! It seems odd, but it pairs so well with meatloaf. This looks AMAZING! My family loves meatloaf, and honestly adding cheese is a bonus! Definitely a recipe worth saving! Oh I hope you guys enjoy it! The cheese adds so much flavor to the meatloaf. I won’t eat it any other way now! I don’t usually like meatloaf, either. I will only eat it if it’s made with cheese like this.